Scroll down to discover current contemporary homes for sale in the Upper Valley of Vermont and New Hampshire. Look through hundreds of listings to find your new home. Contact us if you are interested in touring one of the currently listed Barnard Vermont homes below or any other property. To receive updates on this listing or your other favorite homes, you can sign up for our website. Private country setting, nicely appointed two bedroom, two bath, multi-level building with elevator, security entrance foyer, spacious kitchen, state-of-the-art on-site fitness facility, individual storage unit, central air, deck, patio, minutes to two hospitals and Interstate. Contemporary 3 bedroom, 3 1/2 bath gem with lots of flexible space. Bedroom suite on ground floor and also on the second floor. Open floor plan, cathedral ceiling in the living room, and lots of deck space for entertaining. Propane fireplace to stay cozy and warm in the winter months, central A/C for the hot summer days. 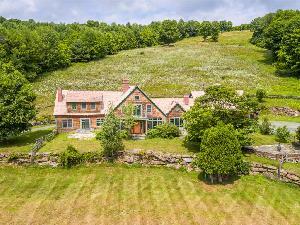 This well kept home is on 4.06 private acres and represents great value in today's marketplace. Sited nicely away from the busy roads and on an over-sized lot, this property will put you in walking distance to Hanover's nursery, elementary and junior high schools. The golf course is around the corner as are groceries and other conveniences. Built to stand the test of time, this house will amaze you with its construction. Steel beams supporting concrete floors on two levels have carried this mid-century modern brick home solidly since 1947. Offered for sale for the first time in 45 years, this is a must see for anyone interested in making a mid-century jewel shine again. A hidden gem! This serene home is filled with southerly light year round and has been comprehensively renovated with many new components: thermal windows, heating system, baths, kitchen, foam insulation, detached garage and extensively landscaped with a pan-Asian aesthetic. The residence is very privately sited on 5 acres of open and forested land divided roughly 50/50 by the Woodstock Village and Town boundary. A massive 'butte' of exposed granite contributes to the great character of the property. Landscaped with perennials, water and exposed ledge and stones accented with mature northern hardwoods and conifer the land has delightful diversity. Single level living areas are accessed via a walk-out lower level entry at grade. Looking to downsize without compromise? This home should be on your list! Beautifully updated and maintained Yankee Barn home with easy access to Eastman's north entrance and walking trails. The open floor plan of the main living area allows the solid pine floors to shine and shows off the completely updated kitchen with center island seating. Entertaining is a breeze in the warmer months on the large deck and screened in porch. The first floor master has brand new carpet, large walk-in closet with built-in shelving and a newly updated master bath with a double vanity. You will love the additional space offered in the oversized loft upstairs and the two additional bedrooms and bath allow space for everyone. There is outdoor space to suit any need and the unfinished basement and 3 garages offer space for all your storage needs. This home is a must see and truly has it all. This VT Land Trust protected property has fabulous big views of the CT River Valley on 18.8 acres in a quiet rural neighborhood close to W. Lebanon shopping & Quechee. At 4,100 sqft, this contemporary estate boasts a spacious open floor plan with 4-5 bedrooms /3.5 baths (septic designed for 3 bedrooms), central air conditioning, large energy efficient windows with views in all directions, & an abundance of storage for the primary home buyer. There are even roof mounted solar panels for electrical savings (net-metering). The sprawling 30x18 country kitchen has plenty of cupboards for storage, center island to increase counter space, a lovely eat-in breakfast nook, floor-to-ceiling bookshelves, & a gracious lounge area w/fireplace that can host a generous party. It spills onto a pleasant screened-in porch & deck. There is an equally grand 39x24 dining room & living room with expansive windows to enjoy the morning sunrise. A first-floor master bedroom suite has a large bathroom w/whirlpool tub & separate shower, and a generous walk-in closet/dressing room. There is plenty of space for family with additional bedrooms w/private baths, a theater/game room, & family room in the finished walk-out lower level. FURNITURE PACKAGE AVAILABLE. It's a lovely Vermont setting, with an abundance of wildlife (20 deer at a time!). 15 mins to West Leb., 20-25 mins to Woodstock & DHMC. A tremendous location for an Upper Valley professional, vacation retreat, or larger family compound. A delightful contemporary Post and Beam Eastman home move-in ready! Relax and enjoy the 2.50 acre private double lot. The house has a freshly painted interior and exterior. New roof and windows in 2017, drainage added, kitchen upgrades, remodeled bathrooms and new woodshed. The community offers recreational activities for all ages including golf, water sports, exercise classes, beach, trails for hiking, cross country skiing, snow shoeing, pickle ball, tennis, indoor swimming pool and more. Convenient to interstates, the Upper Valley and ski areas.